I had seen a lot of these tin pins (I think they’re also called “flair”) for years, and knew I couldn’t make any for OWH due to the extra postage. But now that I can pay my own way at the USPS for sweet cards like these – I can make them for special occasions! 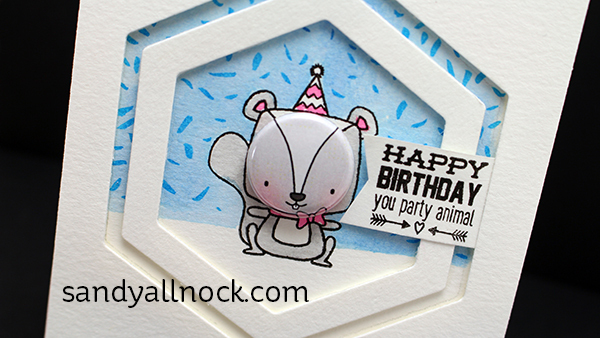 Darcie’s makes these sweet little embellishment + stamp sets. You can use the stamps solo, of course, as well as with the pins, but in either case—-there’s a fox! Yeah. You know how I am about foxes, right? 🙂 Check out the video below or click HERE to see it in HD on YouTube. This one is an animal – I’m actually not positive what it is. If I use it without the pin I’ll color it like a raccoon or skunk I think. But the pin is light grey with a white stripe on the head….so I’m not actually sure what animal it’s supposed to be. I’d say a mouse if the tail was thin…I’d love your input! And then there’s the cute little buck! There’s also a coffee/donut and milk/cookie set – linked it below as well in case you’ve got a sweet tooth too! Neat! I’ve never seen those tin pin cars before! 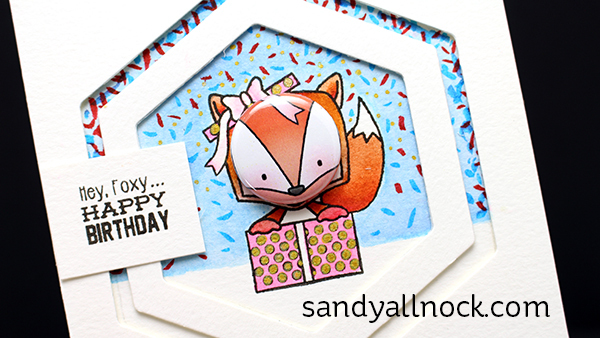 I just love how you did the hexagon frame and the confetti! I think it is a skunk but He could be whatever you want. great video and coloring. thanks for sharing. So cute! I ordered everything to make these from EH. Can’the wait til my stuff gets here! These are cute. Love the hex windows. What does own mean? Think that concept is cute but don’t understand the reference. My guess is a beaver judging by the wide flat tail and buck teeth. Super cute idea!!! I thought it was a skunk, until I read the other comments about the gray squirrel. I think it could be either!!! These are all adorable Sandy. My guess would be a chipmunk or squirrel??? Either way, its cute! It must be a squirrel, they go nuts at parties! ….oops, sorry. Oh my…such a cute card! 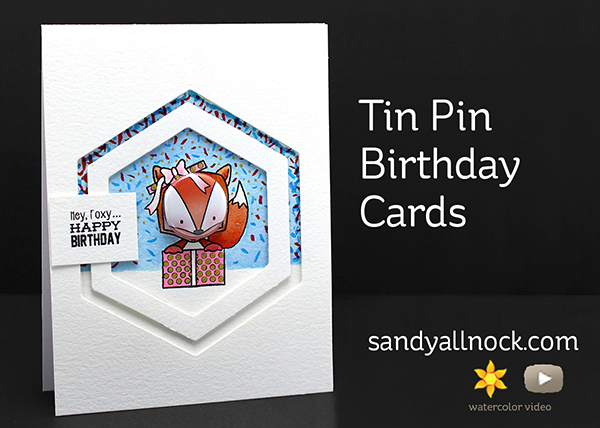 Tin Pin…first for me….love them!! They are super cute and the tin button is really a cute embellishment. Thanks for sharing this cute line of stamps! Yes, I think it most looks like a squirrel because of the tail size. Whatever it is, your cards are cute! My niece would enjoy getting one of these. So cute. I’m with the majority. …….a squirrel. Took a while to figure it out. My LSS (now closed) used to carry these but I never picked any up b/c most of the cards I made were for OWH. They are very cute, so now I’ll have to reconsider getting some! I love the way you used the die as well. Thanks Sandy! Happy Friday! Looks like it’s unanimous – definitely a gray squirrel! But whatever they are, they are “adorbs”! 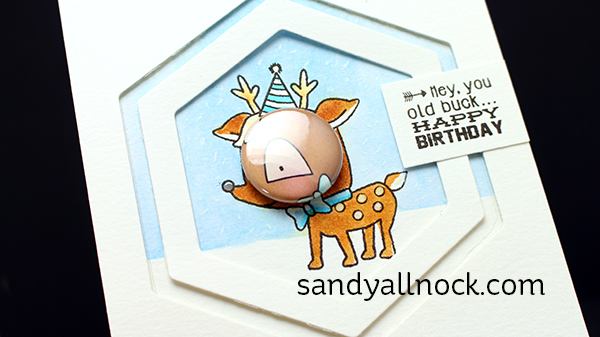 My grandson’s birthday is near Christmas – I’m thinkin the little reindeer will be perfect for his card this year! But they’re all so cute, I can hardly wait to get my hands on ’em! Sandy, I think it’s a gray squirrel. I actually colored one of my jumpstart squirrels gray. Very cute, worth the extra postage! Too cute. I’d say it’s a gray squirrel. I actually colored one of my jumpstart squirrels gray. I thought the same thing. It looks like a squirrel to me.